Christmas time can be so depressing. It brings out some of the worst features of capitalism and rubs them in our faces. You can’t escape, whatever your philosophical or religious belief. Advertisements spur on feelings of guilt if you don’t buy enough of the right kinds of consumer products for people you love. Creative financing is offered so that lenders can make even more profit. And it is an environmental disaster … more plastic, cardboard and packaging is produced, carted about, and dumped into landfills, vacant lots, and incinerators at Christmas time than at any other time of the year. And yet … Nearly smothered beneath piles of gift catalogs and sale circulars, nearly drowned in a sea of synthesized elevator-music Christmas carols, in a locked theological vault guarded down through the centuries by legions of preachers, priests and pontiffs, there burns a persistent secret flame. It is the flame of a revolutionary hope – hope for a better world, a more just society, where the social order is turned upside down so that the poor are fed and the rich are relieved of their ill-gotten gains. And it is something that working people of any culture, any religious or philosophical background can relate to. Once upon a time, in a land far away on the edge of a great empire, there was a people with an ancient culture, a storied past, and a great literature, who had been conquered by a technologically advanced imperial power. They were occupied by foreign soldiers and ruled by corrupt local despots who collaborated with the foreign oppressors. There were periodic revolts of local peasants and slaves that were put down mercilessly. She and her fiancé are then forced to make a difficult journey while she is in the last weeks of her pregnancy, ostensibly to comply with the demands of their imperial rulers to register for a census. They are denied lodging in local inns. Homeless, the young family takes shelter in a stable, where the mother goes into labor and gives birth to a baby boy among barnyard animals. Hardly an auspicious beginning for a child in whom his mother had placed such hope. And then things get worse. The local ruler, a collaborator who is kept in power through an occupation army, decides on an act of terror. Convinced that a revolt is brewing in the village where the young couple has just had their baby, he sends in death squads to kill all the male children under a certain age. Fortunately, the young family is tipped off and they flee into a neighboring country. There they wait until they receive news of the death of their corrupt local despot, and thereafter return to raise their son in their hometown. When he grows up, the boy becomes a carpenter. As if to fulfill the revolutionary hope expressed in his mother’s song, he goes on to organize a movement for social and economic change. It is composed of a coalition of fishermen, reformed prostitutes, the unemployed and low-level public servants, with a cross-section of men and women, and people of different ethnic backgrounds. “Prepare ye the way of the Lord, make his paths straight. Every valley shall be filled, and every mountain and hill shall be brought low, and the crooked shall be made straight …” (Luke 3:4-5) . And so, when you look at the Christmas story closely, you find a story of working-class people living in difficult times, in circumstances not too different from those faced by millions of people today. These are people who are aware of their history of struggle. They draw strength from the lessons of the past and nourish hopes and dreams for a better world. The political ramifications of this carol were well understood by some reactionaries in our own country and it continues to be controversial. The song was banned for years in many conservative churches in the U.S. and many radio stations in the South refused to play it. So, whenever you get weary of the holidays and all the claptrap that surrounds them, remember the young family of the Christmas story, how they hoped and dreamed for a revolutionary transformation of their country and how they persevered in the face of oppression. Whoever you are, have a merry and revolutionary Christmas. And let us then enter the new year resolved to wipe out homelessness, poverty, racism and injustice once and for all! This article originally appeared in the Peoples’ Weekly World, Dec. 22, 1999. 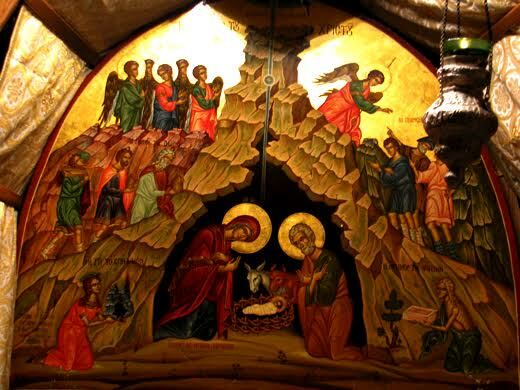 Photo: The icon nativity above the altar in the Grotto of Nativity, Bethlehem, UNESCO World Heritage site. 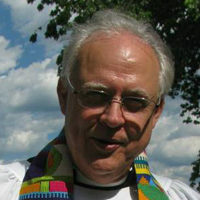 Long time labor organizer, civil rights and peace activist in the U.S., Rev. Tim Yeager is now Team Vicar, St George's, Westcombe Park, London, U.K.